The Classic II is a 9-pattern tube mic featuring a 25mm large-diaphragm capsule feeding a vintage twin triode (New old stock) GE JAN-6072 valve and custom Jensen output transformer. Machined from solid Brass, the body is hand-polished, glass bead-blasted and coated in satin nickel. Also included is a double-shielded oxygen-free 30' copper cable with heavy-duty plugs and sockets, power supply, a suspension shock mount, stand mount, thread adapter and sturdy aluminium flight case. the frequency response is nominally 20Hz to 20kHz (within ±3dB) with a smooth presence lift centred at around 12kHz. The presence rise is most strongly defined in omni mode, but because of the high centre frequency of the boost and the gentle nature of the curve, the sound has an open, airy quality rather than a harsh presence. 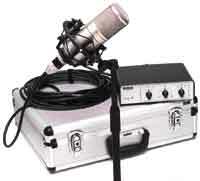 The RØDE Classic II is also known as: Classic II, classic-ll.